· OUTLET PRO is garment factory and branch store management software. It emphasized on stock control and sales management for the factory and each branch store. Due to it is developed for specific business, apparel manufacturer and branch stores, so it is easy to use and very fit to the business. · OUTLET PRO is Web-Based application. So you can work with Outlet Pro anywhere and anytime. You don’t need to worry about the flood, traffic jam, road closed or any unexpected circumstance that cause you cannot work at your office anymore. · Outlet Pro applies the Barcode System for controlling finished goods. That makes controlling and managing the finished goods throughout the system is real-time, clearly and accurately. 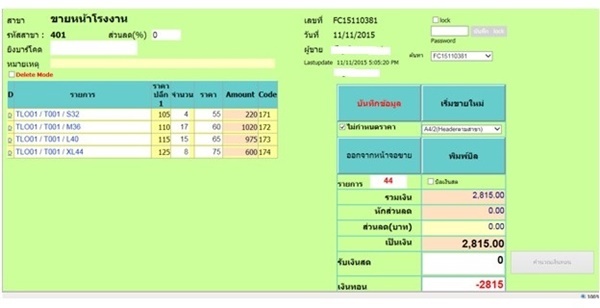 · Many standard forms and reports in the system. Many forms can be viewed and printed out such as production sheet, purchase order, deliver order, receipt/tax invoice, credit notes. Moreover, many standards reports, especially stock balance and sales of factory and of each branch store so that you can manage the overall stock of your company more easily and more efficient. The summarized reports are very useful for your decision making. 2. Finished Goods Management for factory and each branch store. · Production order data can be recorded in the system and the production sheet can be printed out from the system. · The production sheet includes the main order data such as production number, customer, brand, style, size breakdown and also includes materials lists, size specification, other details, etc. 2.Finished Goods Management for factory and each branch store. · The finished goods barcodes can be generated by the system for attaching the finished goods when receiving finished goods to warehouse. · Outlet Pro applies barcode system for finished goods transaction for accurate transaction and real-time information. · The finished goods at the warehouse and all branches can be managed centralization. The finished goods transactions that you can manage by the system are receiving finished goods to the factory warehouse, issuing delivery order to the customer/ branch, Issuing Receipt, Issuing credit note, transferring finished goods to other branch, return finished goods from branch to the warehouse, and stock adjustment at warehouse/ branch. · Stock card and movement reports of the warehouse and each branch. So you can manage your stock easily and suitably. 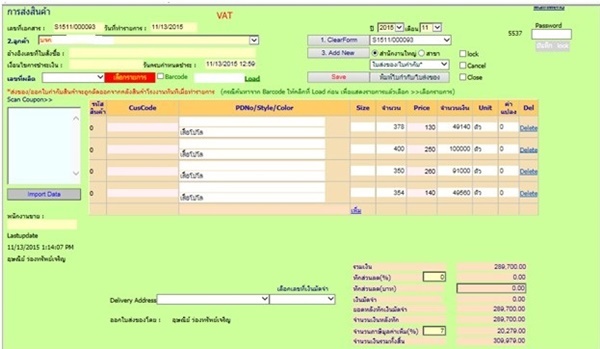 · The delivery order and tax invoice can be generated by the system. Moreover, credit note and Sales tax report also can be generated by the system automatically in real-time basis. · Daily Sales Report and Sales Summary report can be generated by the system for sales analysis. You can save much time for preparing the reports. · Point of sales transaction can be done very easily by scanning barcode and the stock will be automatically updated real-time. · The price and discount rate can be set in advance in the system so that the price will be shown and calculated automatically when doing sales transaction. However, the price can be changed manually by authorized person. · Many sales reports for sales analysis such as daily sales report, summary sales reports of every branches. · Materials Group, category and materials code can be specified in the system for materials control. · Purchase Order can be issued by the system very easily referring to the production order. · Materials transaction, receiving, request, return transaction can be controlled and managed by the system. 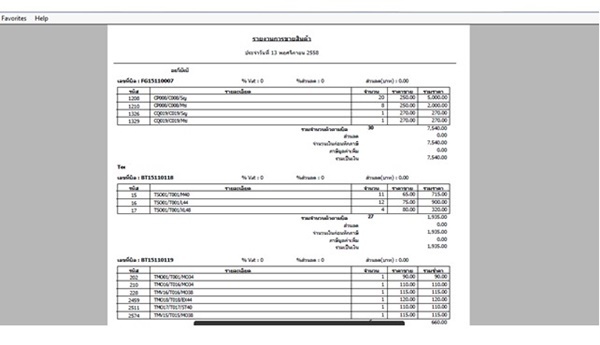 · Many materials balance and movement reports can be viewed and printed out very easily.